The weather is unpredictable, and temperature fluctuations can occur even in the most regulated climate-controlled environments. When you're shipping sensitive packages, add a Temperature Monitor Label to keep a closer eye on how hot or cold your shipment gets as it travels from one place to another. When a temperature threshold is reached, these handy indicators change color, so you'll know if your shipment was ever out of its expected temperature range. 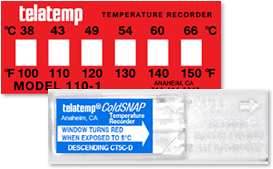 • Miniature ColdSNAP recorders monitor food, medical supplies, or industrial materials, so you'll know if the temperature dips below freezing. • A non-reversible temperature indicator is easy to apply and the windows turn black when it passes the marked temperature, from 100° to 150°. The color won't change back if it cools off. • WarmMark tags offer the highest accuracy for keeping your important shipments at or below room temperature. Great for medical shipments or industrial materials. 1.38" x .69" x .22"